Home » Misc » Amazing Weight Loss Stories. By Sparky in Misc on April 12, 2009 . One of the most heartwarming diet, health, and weight loss stories that has been ongoing since January 2006 is the effort being undertaken by former half-ton man Manuel Uribe, aka “The World’s Heaviest Man,” to lose almost 1,000 pounds and save his life. Manuel Uribe Garza (born June 11, 1965) is a man from Monterrey, Nuevo León, Mexico, and was one of the heaviest people in medical history. After reaching a peak weight of around 597 kg (1,316 lb) and being unable to leave his bed since 2001, Uribe lost considerable weight with the help of doctors and nutritionists, and by following the Zone diet. Uribe drew worldwide attention when he appeared on the Televisa television network in January 2006, but turned down offers for gastric surgery in Italy. In March 2007, Uribe set a goal to lower his weight to 120 kg (265 lb). He has also been featured on “World’s Heaviest Man”, a television documentary about his bedridden life and attempts to lose weight. By the end of 2008, Uribe had reduced his weight to 360 kg (800 lb). His weight loss efforts continue to this day. 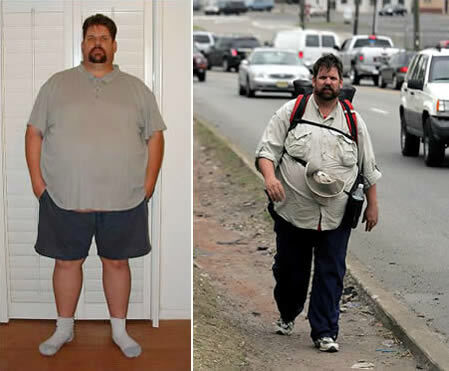 This is an amazing weight loss success story of a former 630-pound man named David Smith. In 2003, David weighted over 600 pounds and decided to change his life only through carb cycling and exercise. After 4 years, he weighted a stunning 229 pounds, losing 401 pounds but still had excess skin on his body. He underwent several surgeries to remove the excess skin; since then, he looks just like any other guy, and became a certified personal trainer through ACE. 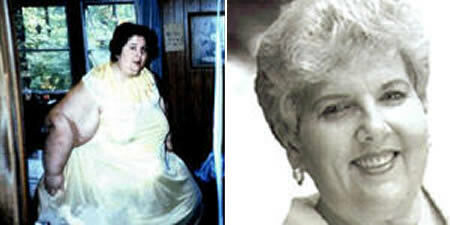 Rosalie Bradford (1943 – 2006) holds the Guinness World Record for most weight lost by a woman. In 1987, the longtime binge-eater weighed an astounding 1,199 lb, having spent 8 years immobile in bed. Following an intervention from friends and weight-loss guru Richard Simmons she started exercising as best she could (she could only clap her hands to Simmons’ videos at first) and amazingly eventually slimmed down to about 200 lb. Sadly enough, in one of the five sessions of surgery to remove excess skin during her weight loss, she had some complications that later caused her death. She died on November 29, 2006 at a hospital in Lakeland at the age of 63. Rosalie Bradford posthumously continues to hold the world record for having lost the most weight. John Stone is an internet legend. This man fell into a pattern familiar to many people: being reasonably athletic at some point and then gradually letting it all go, so in 2003 he decided to make a few major changes, establishing a fairly tough goal: to lose his beer-belly. So he went to the gym. Five years later, it’s difficult to recognize him. John Stone became a bodybuilder and every month during the past 5 years he took pictures of him and put them on his blog. See what desire and hard work can do. Rob Cooper, also known as the Former Fat Guy once weighed 475 pounds. Through a system of natural health, whole foods and a basic walking program of 20 minutes a day, lost nearly 300 pounds of fat over 2 and a half years. He began weight training and put on over 50 pounds of muscle in the years since, lowering his body fat even further. Residing in Canada, Rob is now healthy, muscular, and follows a healthy eating plan and exercise routine. Jon Brower Minnoch was born in 1941 and held the record of the world’s largest man. At his peak in 1978 Jon Brower Minnoch tipped the scales at an estimated 635 kilograms or 1397 pounds. He had to be hospitalized. 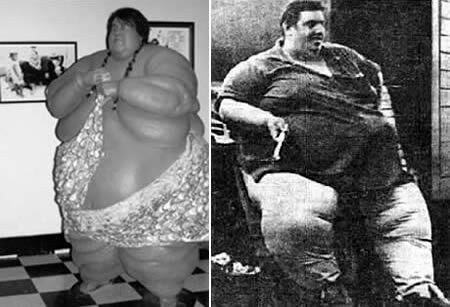 After following a strict diet plan, Jon Brower Minnoch (USA), reduced to 216 kg (34 st) by July 1979, thus indicating a weight loss of at least 419 kg (66 st) in 16 months. This averages at 22.05 kg (3 st 9 lbs or 57.75 lbs) a month! The diet consisted of just 1,200 calories a day. Sadly, though, by October 1981, the former taxi driver had put on over 89 kg (34 st), undoing all his good work. Jon Brower Minnoch passed away on September 10, 1983 weighing 362 kilograms or 796 pounds. Michael Hebranko (b. 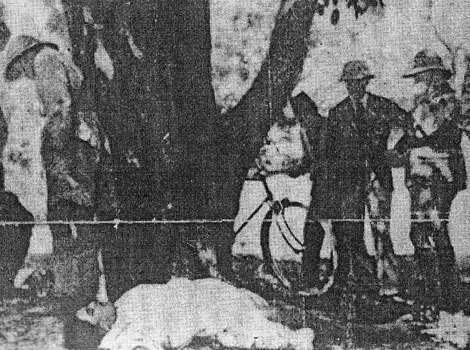 May 14, 1953) suffered from an extreme case of morbid obesity, known to be among the heaviest people in the world. After a stay at the St. Luke’s Hospital in New York, he dropped his weight from 411 kg (910 lb) to 90 kg (200 lb) and waist size from 290 cm (110 in) to 91 cm (36 in) in 19 months with the help of the dieting and exercise coach Richard Simmons and was recorded in the Guinness Book of World Records for the highest recorded weight loss in 1990. He lost some of this weight from surgical removal of fat. He then toured the United States lecturing about his experiences and advocating dieting and exercise and appeared in infomercials promoting Richard Simmons. However, seven years later, he gained up to 453 kg (1,000 lb) and had to be repeatedly hospitalized to the Brookhaven Rehabilitation and Health Care Center. In June 1999, Hebranko was at his peak weight of 500 kg (1,100 lb). Steve Vaught undertook an incredible challenge beginning in 2005: to walk across the US. He began the 3,000-mile trek from his Oceanside, California home to Manhattan on April 10, 2005, when he weighed 410 pounds and was suffering severe depression after accidentally killing two pedestrians while driving 15 years ago. thinking. ‘ Marked distress regarding binge eating is present. Avoid watching television, driving the car, or talking on phone when you eat.